Words refuse to escape my lips today and I cannot find them. Failing to make complete sentences. Failing to join together in expressive thoughts. Failing to unite my emotions and intellect. Oh the agony of a soul at a loss for words. Yet as Creator of the universe, You have provided. With groaning too deep for words. You, the God who knows all, intimately knows my heart. Likewise the Spirit helps us in our weakness. For we do not know what to pray for as we ought, but the Spirit himself intercedes for us with groanings too deep for words. And he who searches hearts knows what is the mind of the Spirit, because the Spirit intercedes for the saints according to the will of God. Perfect prayer! I especially love the verse you chose from Romans. “The Spirit intercedes for us with groanings too deep for words”. Wow! Those words cut me to the quick today! Blessings, my friend! So grateful He discerns our hearts & prays for us. 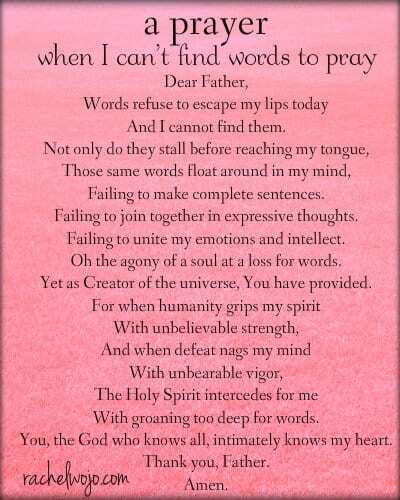 Beautiful prayer! Sometimes when my soul is at a loss for words, that is when the still, small Voice speaks most clearly. amen Sister. Blessings to you.